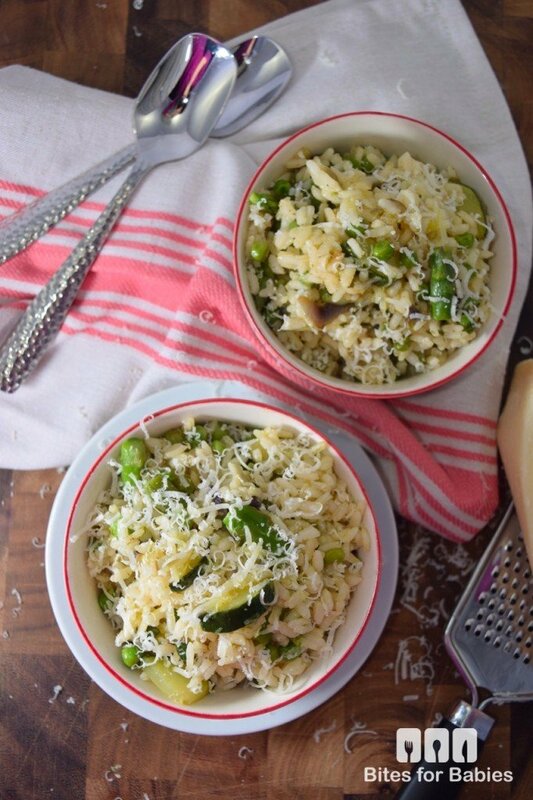 Homemade risotto is a great way to showcase fresh ingredients, especially fresh produce. When prepared correctly, risotto should be rich and creamy without being heavy. With its creamy consistency and mild flavour, risotto is an ideal meal to serve babies too. You can personalize the recipe to suit baby’s flavour preferences, and it’s also a great way to offer fresh vegetables to baby since their flavour is somewhat subdued by all the other flavours in risotto. The key to a perfect risotto starts with the short-grain rice, such as arborio rice, which is the most commonly available variety. Short-grain rice contains amylopectin, a starch that easily breaks down when cooked, thus giving risotto its traditional creamy texture. When it comes to flavour, good quality ingredients—fresh, homemade broth, good quality extra-virgin olive oil, and fresh herbs and spices—can make or break a risotto. Despite its reputation for being fussy and time consuming, risotto is essentially “easy to make.” Coincidentally, it’s also very easy to mess up! Common, simple mistakes could turn your culinary masterpiece into a heavy, mushy mess on your plate. Add warmed or hot broth: Cold broth will cool down the rice and prolong the cooking time. Keep the broth at a simmer in a separate small pot on the stove. Stir the rice at five-minute intervals: Over-stirring will add air to the risotto, which will cool it down and result in a sticky risotto. Not stirring enough will result in the rice sticking to the pan and burning. Add broth a little at a time: Slowly add the broth (about 3–4 cups of broth per 1 cup of rice), 1–2 ladles a at time, stirring each time. Adding too much broth will result in a soupy risotto and will prevent the starches in the rice from creating that creamy starchiness. Do not overcook the rice: The rice should be al dente, meaning cooked on the outside and with a slight bite on the inside. Risotto should be creamy and light, not mushy and starchy. Cooking temperature: Cook at a medium to low simmer in order to avoid burning the rice or prolonging the cooking process. Cook the vegetables separately: Except for the mirepoix (onions, celery, and carrots), you should add cooked vegetables a few minutes before the rice is done, to ensure they do not lose their flavour or texture. 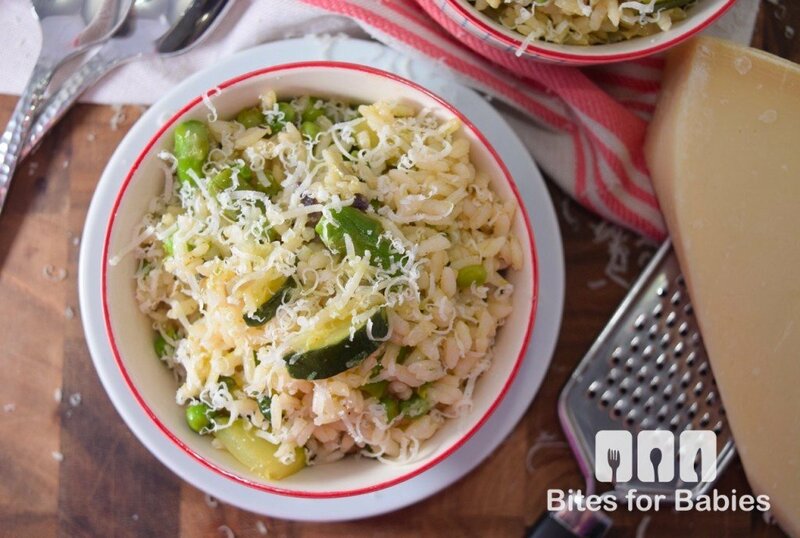 This delicious Healthy Risotto Recipe Risotto is a quicker, easier rendition of the traditional recipe, in case you’re not yet comfortable with making the traditional version. The spring risotto is fresh, light-tasting, and packed with seasonal produce, such as asparagus, peas, and zucchini. Get the full directions for Healthy Risotto here.